Harry Maguire has saluted Brendan Rodgers' impact as Leicester target their best run for two years. The Foxes host Newcastle tonight aiming for a fifth straight Premier League win, something they have not achieved since Craig Shakespeare's first games as boss in 2017. 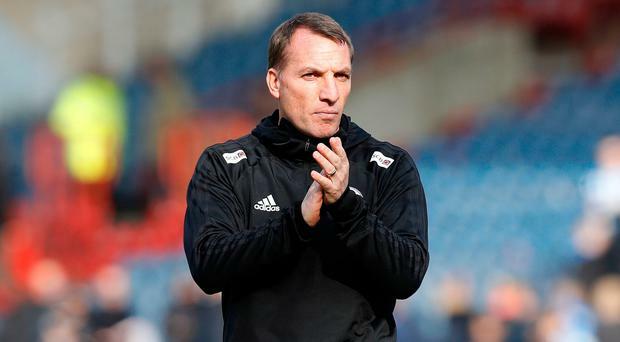 They are seventh, leading the race for a possible Europa League spot, and Maguire believes Rodgers' influence is key. "He's a really good coach who will improve us as a team massively. The club has shown really great ambition in luring him here," said the England defender. "He breeds confidence into players, he's helping to bring the younger players through, does a lot of work on the training pitch and his man management is really top. He's made a really big impact. "Over the last four games, we've started to pick up results we've warranted. We're scoring the first goal in games which is important so we can kick on and get a second and third. "The performances have been really good and I think in every game we've deserved to win." Rodgers has won four of his five games since replacing Claude Puel after a last-minute defeat to Watford in his opening match. He has Maguire available again after the defender was rested for the 4-1 win over Huddersfield last weekend following the birth of his daughter Lillie. Maguire added: "It's a great moment for myself and (my fiancée) Fern. She's doing all the feeding at the minute, so it's tougher on her, but it's a really nice time for us both and we're really looking forward to it." Newcastle have lost their last two games and Maguire scored in Leicester's 2-0 win at St James' Park in September but he expects Rafa Benitez's side to provide a stern test. "They'll be very hard to beat. They don't concede many goals and don't lose by many goals," said the 26-year-old. "They'll probably sit back and try to hit us on the counter attack. "They're a good team with a great manager and have had a good season. It'll be a tough game, but one that we're looking forward to. We've had a nice little run of fixtures and the boys have capitalised on them really well, winning four games on the bounce is a great achievement. "Now we're coming into a set of fixtures that are difficult, but I think we have more than enough ability in our squad to go and beat any team in the Premier League." Danny Rose is driven on by the chance to make this season “one of the best Tottenham has ever had”. Newcastle schemer Miguel Almiron is facing a race against time to be fit for this summer’s Copa America after being ruled out for the rest of the season with a hamstring injury.